The creek is actually a canal in the neighborhood of 500 feet long. When it is completed it will appear even longer because of the jetty which will extend into the Sound on the north. This jetty is progressing in construction, a number of yards of foundation being already in place. The care and precision with which the contractors are finishing the banks and grading the surrounding areas has attracted favorable comment. Due regard for the nature of the locality, which is entirely residential, has influenced the contractors, and there will be no detriment to this locality so valued for summer camps and residences. At the present time the dredging is nearly complete, although the creek is not yet open to the sea and is still crossed by a narrow fill to enable the working trucks to pass back and forth. This is because of the great amount of grading which is being done. The surrounding areas have always consisted of dunes, with some sparse growth of bushes in and around them. Because of the fill which is available, this area will be left level and smooth, ready for whatever improvement may be decided upon in the way of seeding, and not at all unpleasant to look upon even if nothing further is done. The several rods of land on which parking will be permitted will be level and hard and suitable for use in any season. 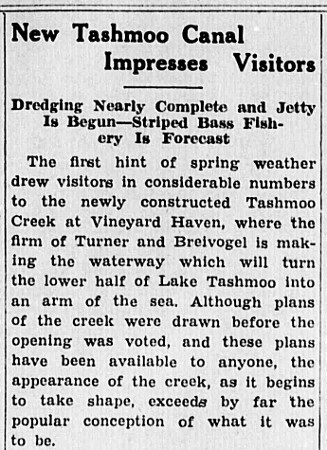 Some of the sportsmen who have visited the creek have offered the opinion that a brand new bass fisher is in the making. They say that the flow if fresh water which will tincture every ebbing tide will prove to be an infallible lure for the stripers, and point out that the bank of the creek is a spot made to order for rod and reel fishing. While it is true that the digging of this creek has necessitated the removal of the bridge by which access to the Cornell place was gained, a glance at the prospect reveals the actual advantage to Miss Cornell. The inhabitants of Tisbury have a perpetual right in this creek for the purpose of fishing, which includes the right to go to and from the creek for such purpose. As the only way that has existed for years leads to the creek on the side opposite the Cornell residence, there can now be no possibility of annoyance to Miss Cornell or her guests through the presence of fishing parties. A road will be made available for Miss Cornell’s use on the same side of the creek as her home and will be a private way. Weather permitting, the creek should be completed within a few weeks, but with the ground thawing, the moving of stones is help up from time to time and it is impossible to arrive at any definite date. Incidentally, this is one of the very few construction jobs that has been pursued right through the depth of a Vineyard winter, and a hard one, so far as temperature level is concerned.